Last week, a NSW principal claimed that laptops in many classrooms were proving to be more of a distraction to students than a helping hand. Sydney Grammar School headmaster, John Vallance, said that the billions of dollars being spent on providing students with laptops was a “scandalous waste of money” as grades gradually dropped across the country despite the investment. However, some schools are seeing dramatic improvements in student learning as a direct result of implementing technology – in a considered and practical way, that is. One such school is Saint Stephens College, located on Queensland’s Gold Coast. Its head of e-learning, Peter West, says he has embarked on a long but ultimately rewarding journey of blended learning. However, West told The Educator that the issue of schools adopting technology without having a cohesive plan to improve student learning was both under-discussed and carried with it huge consequences. “You can’t just throw laptops into a classroom and expect change,” he said. West said that organisational change and having the right ICT infrastructure in place were paramount if students were to benefit from the use of digital devices like laptops and iPads in classrooms. “It’s a gradual process, but it’s the biggest disruption in education for over 100 years, so we have to ask what we are preparing kids for,” he said. Saint Stephen’s College has now expanded its laptop program to Year 6 students, a move West said was working well. He attributed this to the school’s patient and considered approach to what worked and what didn’t before implementing its Bring Your Own Device (BYOD) program. West said there was a mixed sense of foreboding and opportunity prior to his school implementing its laptop program. “When our school first introduced laptops into the classroom we thought ‘this is either going to be the biggest distraction and everything will come crashing down – or it will be the biggest advantage we’ve ever had,” he said. West said most teachers already know which of their students are likely to be distracted, adding that most children do the right thing and use their devices for classwork and not leisure during lessons. 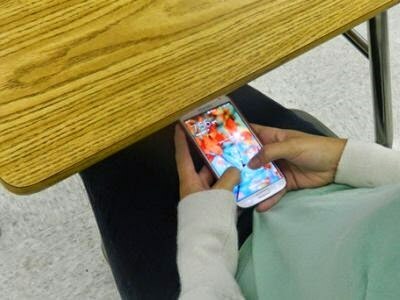 “For every one of those distracted students there are 20 other kids who do the right thing, so why should we disadvantage them by restricting this technology in class?” he said. West said the conversation needs to be changed from teaching to learning so that students can be educated with technology in a way that enhances learning. He suggested that teachers adopt collaborative learning tools that students can personally engage with. “Powerpoint is designed for teachers – not students. Teachers use this to stand at the front of the classroom and talk to students, but it’s not really a learning resource,” he said. “However, if you use Office Mix and narrate from it and draw on it while you’re talking, then your students can watch it and get full understanding of what’s being explained. That’s a learning resource.